Apple says that its Siri digital assistant will now better understand what you want, supplying the information you need when and where you need it. Apple said its Siri digital assistant will soon become far more helpful, proactively—but discreetly—figuring out what you want to do before you do it. The upgrade, announced Monday at Apple’s Worldwide Developers Conference and expected in iOS 9, will put Siri more on a par with Google Now and Microsoft’s Cortana, reminding you when you need to leave for an appointment, queueing up your favorite jams when you hit the gym, and other helpful features. Siri fields a billion requests per week, according to Craig Federighi, Apple’s senior vice president of software engineering. Siri also responds to those requests with just a 5 percent error rate, he added. But until now, Apple’s Siri has been rather sullen: While the digital assistant can set reminders for you and tell you the weather, she hasn’t been able to surface information that you don’t request from her, like what time to check into your flight or how far you are from your hotel. Android’s Google Now and Microsoft’s Cortana, meanwhile, now focus on providing answers, and answers when you need them. That’s changed the game in the battle of digital assistants, beyond just answering questions. Siri will know you well enough to pump your jams when it's time to hit the gym. Reminders: Siri can remind you to do something when you’ve arrived at a place, and she also knows what you’re implying. As an example, Federighi received a text message, and he ordered Siri to remind him about it. Siri created a notification linking to that text message. Siri will also tell you when you need to leave for a meeting (see image, top), based on traffic and the distance you need to travel. Apps: When Federighi walks into the gym and plugs his headphones into his phone, Siri cues up some peppy music to help him work out. 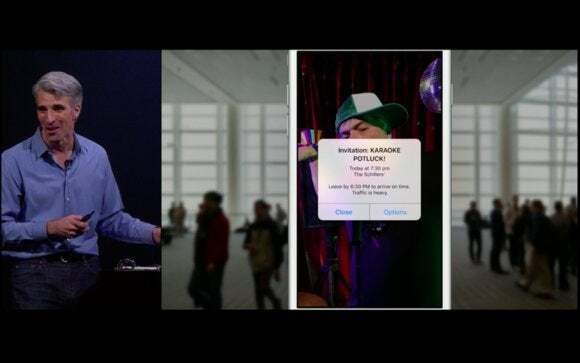 The implication is that Siri knows where Federighi is (the gym), what he’s doing (exercise); what kind of activity he likes to do when he gets there (listen to music)—and what kind of music to play (fast, uptempo). Knowledge: When a phone call comes in, Siri checks to see whether the number is listed in your contacts. No surprise there. If no contact is found, Siri can scan your email to see if the number is tied to a name. That trick works for apps, too: Siri can find content within the apps you’ve installed, such as deep links into Airbnb, for example, or a recipe. And if you want a quick measurement conversion, for example, you can ask Siri—she’ll pop up a quick card with the answer. Siri recommends apps and contacts based on where you are and who's around you. Even better? There’s a third-party API that developers can tap into to improve that knowledge even further. Home control: With the upcoming WatchOS 2 for the Apple Watch, you'll be able to control HomeKit devices via Siri. Kick off specialized tasks: Also with the new WatchOS, you'll be able to use Siri to start workouts. "Go for a 300-calorie bike ride," you'll be able to say. "Go for a 30-minute run in the park." 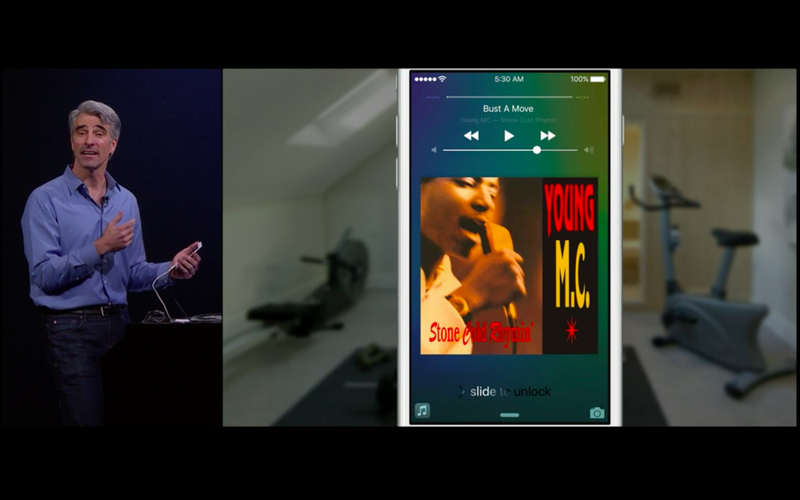 Music: Siri can find you what you want to listen to, using the new Apple Music service. You'll be able to issue requests like: ""Play the top 10 songs in Alternative," or "Play the song from Selma," or "Play the top song from May 1982." The new Siri also does one thing better than the other digital assistants: She can pull up information without mining your personal data. “We do this in a way that does not compromise your personal privacy,” Federighi said. “We honestly just don’t want to know,” he added. 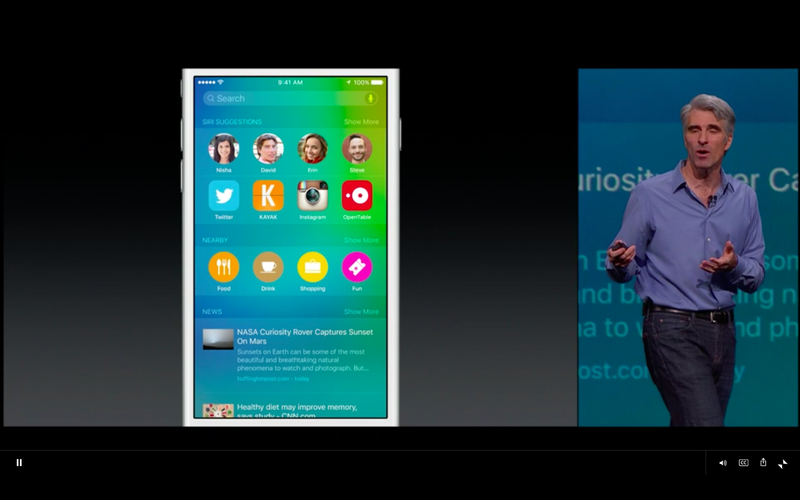 That means Siri won’t be tying map searches to your Apple ID, or name. Email mining for information is done on your device, not in the cloud. Apple won’t be selling your personal info off to other third parties either, Federighi said. All that means one thing: Siri just caught up to Cortana and Google Now. And she’s far more useful—and helpful!—than before. Updated at 12:21 PM with additional Siri details in Apple Music.